Flat Katherine! Please note the sheep sweater. The real Katherine’s geocaching name is She-Sheep. Flat Katherine is a variant on “Flat Stanley (wikipedia link)”, which I first encountered as an idea during the 2010 Vancouver Olympics. 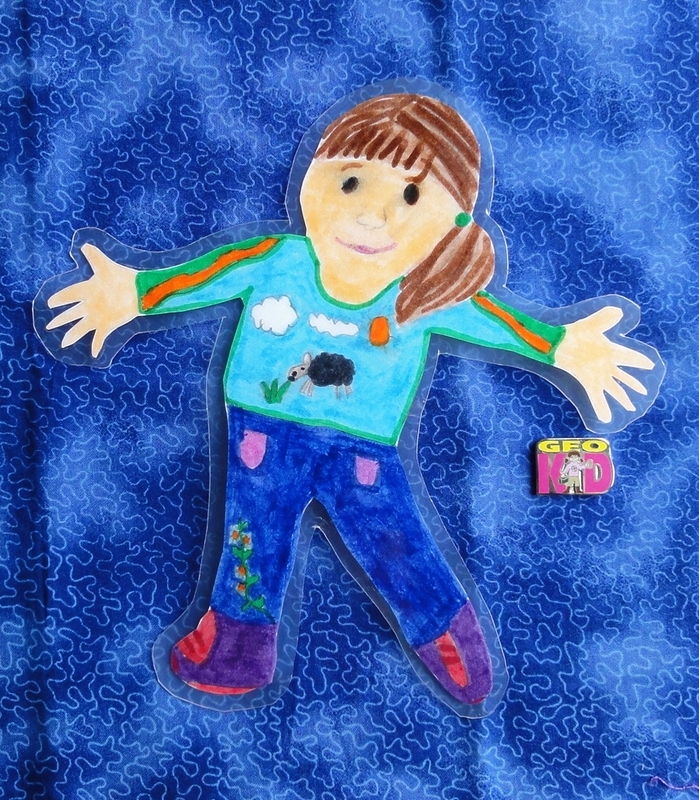 The Flat Stanley Project is a literacy endeavour based on the books about Stanley Lambchop, a flattened child who can go virtually anywhere because of his two-dimensionality. During the Olympics, there were Flat Stanleys (and presumably Philips, Jameses, Karens and Sarahs, among others) sent to different athletes along with expressions of support from thousands of school-kids. Pictures were taken of these little creations with various public figures and children were able to travel vicariously through their flattened selves. Since I booked my ticket for Vancouver, Katherine has been disappointed that she could not come too. As a way around this, I had her make a “Flat Katherine”, which I will take with me (along with her Geo Kid geocoin, pictured above). Flat Katherine will fly in the plane with me, come to the Vancouver Aquarium with me, visit the MEC with me, go hiking with me and hopefully will have a good time. I’ll post pictures of our progress, once I get there. Katherine has also decided that, once I get back, Flat Katherine will be travelling the world either by mail or hand-to-hand transmission. I might even turn her into a travel bug (although she’s a little on the large side for that). With that in mind, I had her laminated into two-dimensionality. It wouldn’t do for her to suddenly either go limp or magically regain her third dimension. I hope Katherine and you have a wonderful time in B.C!